If you're in the market for a USB-sized streaming stick that comes with a remote and one of the most improved operating systems around, the Roku Streaming Stick is well worth its $49 (£49, about AU$62) price tag. Update: The official Roku app (which can be used to control the device) has received a pretty substantial overhaul. The biggest addition is a new 'What's on' section, which provides an easy way to view a curated selection of recent television and movie releases. The app has also received a more general design overhaul to make it easier to navigate. The original Roku Streaming Stick, the one released back in 2012 before the Chromecast came onto the scene and the Amazon Fire TV Stick had ever been conceived, was a landmark innovation for streaming video players. At $49 (£49, about AU$62), the Roku Streaming Stick was cheaper than anything else on the market and smaller by far. It packed all the independent goodness of Roku OS, as well as over 1,000 channels, into something the size of a USB stick. Even after Google and Amazon's smaller streamers came out in the following year, the Roku Streaming Stick still had some features the other two lacked: a sophisticated remote and an app store that didn't care whether you picked Amazon Instant Video over Netflix, or chose rental services, like Vudu and Fandango, over Google Play TV Shows and Movies. Now, that's not to say the original was perfect. It was laboriously slow, taking what felt like hours to fully populate the user interface. And, for the first year, you couldn't even plug it into the back of most HDTVs – only ones with a special, MHL-compatible HDMI port. The latter was fixed quickly, but the processing problems would persist for years. A fix for that dilemma wouldn't come until this year, when Roku announced a new, even smaller version of the Roku Streaming Stick that packs in a quad-core processor for about eight times the performance of the original. The latest iteration of the Roku Streaming Stick is everything the company set out to design all those years ago. The difference now is that it's faster and smarter, thanks to software updates to Roku OS, but also more versatile, too. It leverages most of what makes the Roku 4 such a phenomenal streaming video player into a device that's a quarter of the size and a third of the cost. That said, at $49, Roku Streaming Stick does cost a little more than Chromecast and doesn't offer comparable special features, like mirroring an entire computer to the TV. But, you can chalk those up to the price of having more apps and a physical remote control. The new, smaller design has undergone a bit of a wardrobe change, trading its old, obnoxiously bright purple covering for a sleek, matte black. It's now more similar in shape, color and size to Amazon's Fire TV Stick and measures in at 3.25 x 0.9 x 0.5 inches (L x W x D). If that sounds like it's going to be too long to fit behind your TV, don't worry. Roku now offers a free, flexible extender cable that plugs into the HDMI port on your TV for some wiggle room when placing the Roku Streaming Stick in the back of the TV. Once you have the Stick firmly seated in the HDMI slot, connect it to a wall outlet via the microUSB to USB cable and charging brick. If you have a more modern LED TV, there may even be an open USB port there that can be used to power the device. You'll then need to add the Roku Streaming Stick to your Roku account via its registration website, or create a new account. Annoyingly, however, Roku does require you to input a credit card when you make a new account, which allows for easy debiting should you decide to shell out for pay-to-view content. But it's not just the shell of the Roku Streaming Stick that has undergone a transformation, the internal components are radically different as well. The processor in the latest iteration of the Stick is a quad-core CPU, capable of crisp, 1080p streaming. It runs circles around the 2012 version of Roku's pint-sized streamer and, thanks to an 802.11n, dual-band Wi-Fi antenna, TV shows and movies should now pop up faster and spend much less time buffering. Clearly there's a lot to like here, but remember that the Roku Streaming Stick is intended to be the introductory product in Roku's lineup. Step up to a Roku 2, and you'll get an ethernet port on the back of the box for a more consistent connection to your router. Upgrade to a Roku 3, and you'll gain a multi-functional remote capable of voice search and private listening through a built-in 3.5mm jack. If you decide to plunk down on the new Roku 4, currently my favorite streaming device on the planet, you're in store for 4K streaming from services like Netflix and Amazon Prime Instant video alongside an even better processor, 1.5GB of RAM and an 802.11ac Wi-Fi antenna capable of streaming 1.3 Gigabits of video data per second. At this point, you basically know what you're getting with a Roku remote, but the Roku Streaming Stick's remote is even more basic than you might expect. But before I talk about the physical buttons, let's talk weight. The latest remote is easily the runt of the Roku litter, lighter and thinner than any of the streaming device's other clickers. It's daintier due to a few less buttons – you won't find A, B or a dedicated search button on this iteration of the remote. What it does have is a standard, simplistic-yet-functional set of controls and four media buttons that will call up Netflix, Sling TV, Amazon Instant Video and Google Play TV and Movies at the touch of a button. It's interesting that Google Play TV and Movies has made its way onto the remote, considering that it has a streaming platform of its own, but it's a welcome change over the Rdio button found on the Roku 4 remote. It takes AAA batteries instead of AAs, and what's strange, is that you won't find headphone jack or built-in microphone on this diminutive piece of plastic. For that functionality, you'll now have to download and install the updated Roku companion app – a minor inconvenience that probably allowed Roku to shave a few dollars off the production of the remote and use that for an upgraded processor. Speaking of the app, while it's comparatively heads and shoulders above the software Roku offered in past generations, I still don't find it as useful as the Cast button that comes built into iOS and Android apps. Neither that nor the complete screen mirroring functionality available to Apple TV owners that use iOS and Android TV users with Android TV players. Another entry in the "it looks like a Roku product" category is the interface. The main screen works as a central hub, with separate spaces for Home, My Feed, Movie Store, TV Store, News, Search, Streaming Channels and Settings, all of which are explained in detail below. Home is where you'll find a list of all the channels you have installed on the Roku Streaming Stick, ordered by installation date. My Feed was a new feature introduced at the tail end of the Roku 3 that allows you to track films and TV shows. Say you want to know when a new episode of The Simpsons is available to watch. You'd search the show using the remote, add it to the My Feed section and then anytime it becomes available on Hulu or FOX's streaming apps, you'll be notified. Movie Store and TV Store are two of my least favorite functions on the Roku Streaming Stick. Selecting either of these will take you to the Fandango storefront where you can purchase films or shows at varying prices. If you already subscribe to any streaming service, these two options will likely go unused, however will permanently take up residence on your home screen from now until the end of time. News is a video content aggregator that's similar, but not nearly as effective, as the one found on Android TV. You can select a channel (like technology, entertainment or business, for example) and Roku will spit out a few suggestions from YouTube. Search is the piece-de-resistance of Roku features. Using the built-in microphone on the remote or a text search, you'll be able to inquire about TV series and movies, as well as specific actors, actresses and directors. Search currently pulls in data from 30 different apps (Acorn TV, Amazon Video, Blockbuster On-Demand, CBS All Access, CinemaNow, Crackle, Fox Now, FX Now, HBO Go, Hulu, M-Go, Met Opera On Demand, NatGeo TV, Netflix, Popcorn Flix, SnagFilms, Starz Play, Time Warner Cable, Tubi TV and Vudu, among others) and will list search results from least expensive to most expensive. Streaming Channels is, for all intents and purposes, the storefront for new channels on Roku. There are over 3,000 channels on the store and around 100 "hidden" channels that can only be accessed by entering a channel code on Roku's website, triggering a download on your local system. While Amazon Fire TV and Android TV products act as storefronts for first-party content, Roku takes a more agnostic approach when displaying all of your options. As a platform, Roku TV boasts more than 3,000 channels ranging from the streaming mainstays, like Netflix, HBO and Vudu, to the obscure – there's actually a station called "Firewood Hoarders" – so finding something to watch is rarely a problem. If you're in the US, you'll want to make your first stops at the shop YouTube, Vudu and Crackle for free movies and TV shows, as well as HBO Go, Showtime, FX Now, Starz, Hulu and Plex, if you subscribe to any of those services. Oh, and it's worth pointing out here that the aforementioned last bunch of services do not come free with the hardware and require separate monthly subscriptions. I can't tell you how often I hear horror stories of someone going out and buying a Roku expecting every app to be free. If you're in the UK and decide to obtain a Roku Streaming Stick from overseas, check out Sky's Now TV platform (Sky being a shareholder in Roku), the ubiquitous Netflix and Demand 5. Audio apps of note include Rdio, Pandora, Vevo and Spotify. However, unlike PlayStation Music on the PS4, the latter requires a premium subscription in order to get anywhere. This barrier to entry makes the Roku Streaming Stick one of my least favorite music streaming devices, losing major ground to the new front-runner, Google's Chromecast Audio. But, while the Roku Streaming Stick doesn't win many points in the music or games categories, it has probably the most sports channels of any other platform. You'll find both the NFL Channel and NFL Sunday Ticket in Roku's channel roster, as well as apps for the NHL, NBA, MLB, MLS, college sports and tennis, not to mention some of the more extreme fringe sports that get covered by the Red Bull TV, GoPro and UFC apps. As far as content is concerned, Roku has the most diverse streaming video options of any set-top box. It might not do games or music as well as the competition, but if you're looking for a straight streaming device, it's hard to do much better than this. If you're looking for a petite 1080p streaming device, the Roku Streaming Stick is a solid contender. Menus load a bit faster here than on the Amazon Fire TV Stick, however, that time might be spent pulling out your phone to use the voice search function that would otherwise be readily available on Amazon's Fire TV remote. Likewise, Roku Streaming Stick can just eke out a few milliseconds ahead of Chromecast when starting starting a show or switching from one piece of content to the next. Chromecast might benefit from a dual-band, 802.11ac Wi-Fi antenna but, if you don't have a router with a matching spec, that advantage becomes a bit moot. What I can say with 100% certainty and no caveats is that this model is exponentially faster than any Roku Streaming Stick prior. Roku claims that internal tests show it perform eight times faster than last year's model, and I feel like that number might have been a conservative estimate. I briefly stepped back to 2012's all-purple iteration just to see what it was like, and I was shocked how long it took to do the simplest of tasks. Starting a video took ages and, in the time it took to load an app, I probably could've found my phone from between the couch cushions, opened Netflix there and started a stream all before the Roku Streaming Stick reached the 50% buffering mark. The obvious difference between the Roku Streaming Stick and the high-end Roku 4 is the lack of 4K, HDR and Dolby Vision capabilities, but cramming that kind of power into a device this size just isn't possible with our current technology. Now, that might change four or five years down the line but, for now, if you have a 4K TV and are eager to find 4K content to go along with it, you'll need to pony up the extra cash for a Roku 4 or Nvidia Shield. When you're considering Roku versus its rivals, the two main points to keep in mind are that Roku has one of the largest, most open platforms on the market, and that it works all on its own without the aid of a mobile device feeding it information. Roku Streaming Stick vs Chromecast: This is a tricky matchup. The Chromecast is arguably a more social device, allowing anyone in your house to toss content on the screen at any time, whereas the ideal user(s) for the Roku Streaming Stick is someone living by themselves or a spouse. There are more options for content on the Roku Streaming Stick, both in terms of popular streaming apps (Chromecast can't natively support Amazon Instant Video) and in the obscure. You simply won't find specialized streaming apps called "Made for TV," "Northeastern Baptist Church" and "The Prime Radicals," which specifically focuses on children's math lessons, on any other platform. While there might not be as much to see and do with Chromecast, it only costs $35 (£30, AU$49), about $15 less than what Roku is asking for its USB-sized streaming device. Ultimately, the decision will come down to whether you want a remote and a traditional interface that lumps content in one easy-to-find spot, both of which you can only find on Roku. Roku Streaming Stick vs Amazon Fire TV Stick: If you've already bought into Amazon's ecosphere, the Fire TV Stick will be the proverbial rug that ties the room together – it's fast, responsive and works flawlessly with Amazon's infrastructure. It has a microphone built into the remote and subtle extra features, like X-Ray, which identifies actors and actresses when they're on-screen, that won't go unnoticed. Problematically, however, the Amazon Fire TV Stick doesn't quite like Google very much or always perform a "universal search," often just showing you results from the Amazon Instant Video library. Plus, while the Amazon Fire TV Stick might appear cheap at $40/£35, you'll need to subscribe to Amazon's $99 per year Prime service to really get the most out of the device. The Roku Streaming Stick shrinks the much-loved Roku TV OS and puts it in a package that's a quarter of the size and half the price of the Roku 3. There are over 3,000 apps that range from streaming staples, like HBO Go, Netflix and FX Now to completely obscure channels, like the Aliens and UFOs Channel, Firewood Hoarders and Made for TV. Unlike Chromecast, everything is tied together by a smart, easy-to-navigate interface and a simple-but-effective remote. Inside the stick, the quad-core processor gives the Roku Streaming Stick a snappy response time, while the 802.11n Wi-Fi antenna does a commendable job starting videos faster and rarely falling victim as easily to the dreaded buffering screen. Of course, Roku could've squeezed an extra bit of juice from the Streaming Stick had it decided to use the 802.11ac standard that can handle twice as much data in the same amount of time. Chromecast found a way to do it without raising the price, so I'm not quite sure why Roku couldn't do the same. It also doesn't help that the Roku remote feels less powerful than ever before, thanks to the decision to allocate voice search and private listening functions to the separate Roku app instead of on the remote that will always be in front you. These are minor flaws, obviously, and pale in comparison to the vast improvements that have been made to the performance of the device. Whether you should buy the Roku Streaming Stick over the Amazon Fire TV Stick or Chromecast solely depends on how you intend to use it. 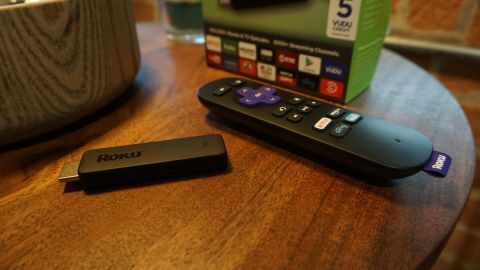 If you're someone who comes home after a long day, grabs the remote and watches Netflix and Amazon Prime Instant Video, and would genuinely consider renting movies from Google Play Movies and TV, there's no better option in the streaming stick category than Roku. On the other hand, if you're the kind of person who often watches shows, movies and internet clips in a community setting and doesn't mind missing out on a remote, you're best suited saving some money and opting for Google's Chromecast. There are more powerful entries in the Roku family of products, like the stellar Roku 4 and marginally better Roku 3, but buying one of those will take a bigger bite out of your wallet and take up valuable real estate on your shelf. Granted you're content with 1080p streaming, want the biggest and most open app store and don't mind using 802.11n Wi-Fi for another few years, the Roku Streaming Stick is an unbeatable value.